Over three decades I have received many requests to travel across Australia and across the world to speak at a conference, teach a course or participate in some worthy event related to permaculture. My reluctance to travel long distances for short stays has meant I have had to turned down many of these invitations. In more recent years the reactions of invitees has moved from incredulity to understanding, and even admiration, as a small but growing list of public figures are choosing not to travel by air to highlight the urgent need to reduce greenhouse gas emissions. For example when I turned down an invitation to fly to Florence to give a presentation for the receipt of the Il Monito del Giardino award, the organisers were very understanding and agreed to a video presentation by me and “handing over” the award by skype. The capacities of the internet ten years ago, let alone today have greatly reduced the “tyranny of distance” that once so plagued Australia as a “New Europe” at the end of the world. Despite the rapidly expanding capacities of the internet we are seeing an explosion in air travel and a normalising of long distance travel for very short visits by the billion or so middle class residents of this finite planet. Although the understanding implied by changing attitudes of a minority of environmentalists is encouraging, I also find it frustrating that there is little systems thinking evident in discussions of the issue. I found this essay Hypocrites in the air: should climate change academics lead by example? by Kevin Anderson very refreshing because it clarified some of the systemic issues that climate scientists and activists should well understand. In particular he shows how speed and convenience of air travel massively increase the distance, and shorten the duration, of travel resulting in a massive increase in greenhouse gas emissions that would simply not happen if people had to travel by train. It is this convenience and bargain basement prices, more than any measure of greenhouse gas emissions per person kilometre, that exemplifies the need for systems thinking rather than reductionist metrics. That essay has also inspired me to explain my own position. I have never seen the burning of fossil fuels as inherently bad. Instead I have seen it as mostly a banal waste of this precious gift from Gaia that remains as important an issue for future generations as the adverse impacts on the climate of their excessive combustion. Oil is a wonderful raw material with which to make a myriad of useful substances and products that will probably not be available to future generations because we have burnt all the good stuff for frivolous or downright evil purposes leaving them the most toxic, hard to get at and depleted sources. I agree with radical environmentalists who say we have to stop burning oil, gas and coal, not only to avoid catastrophic climate chaos but also to ensure that relocalised economies that might survive the energy descent future might still have some to use for special purposes. An early realisation of the banality of our fossil fuel use occurred to me on a sunny Sunday in Hobart back in 1974. A friend who was an abalone fisherman had invited me out for a jaunt in his powerboat. As we sped down the Derwent estuary chasing seagulls, powered by twin 80-horsepower outboards, I remember thinking that our consumption of energy was far greater than that of the ancient kings. While the actions of the ancient kings had immediate consequences for people and nature, ours appeared to be of no consequence beyond momentary exhilaration (and incremental resource depletion). 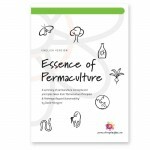 from Principle 2: Catch & Store Energy in Permaculture Principles and Pathways Beyond Sustainability (Pg 51). 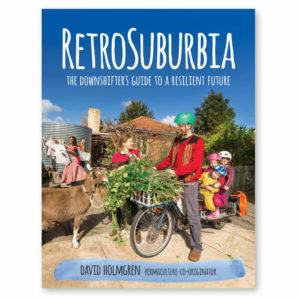 In 1993 I turned down a invitation to be a keynote speaker at the third international permaculture conference and convergence in Denmark because I could not find the time to make it at least 3 months in Europe. But in 1994, with no email communication we organised a 6 month study and teaching tour of Europe, with time in Israel, Greece, Italy, France, Switzerland, Germany, UK, Denmark and Sweden. We organised caretakers for Melliodora and completed the main seasonal harvest, arrived in Israel in April for the start of the northern hemisphere spring and moved through bioregions from the eastern mediterranean to Scandinavia, building layers of understanding of natural and cultural landscapes in the process. 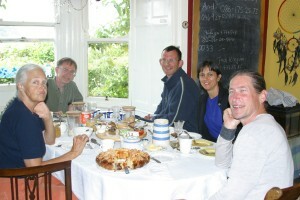 The trip was a hybrid between being celebrity guests and WWOOFing. The costs for our hosts were low, I earned some money, learnt a lot and most importantly, helped consolidate permaculture activism already happening in these countries. At the same time, we visited family in Italy, giving me a connection to Su’s life in Italy and Greece and contributing to Oliver’s education and experience of the world (then 8 yrs old). A significant benefit for me from air travel, short or long is staring out the window reading the landscape whenever possible. For me reading the landscape from the air and on the ground is a compulsory even addictive activity through which I learn an enormous amount. The 1994 trip became the model for another two 6 month trips overseas. 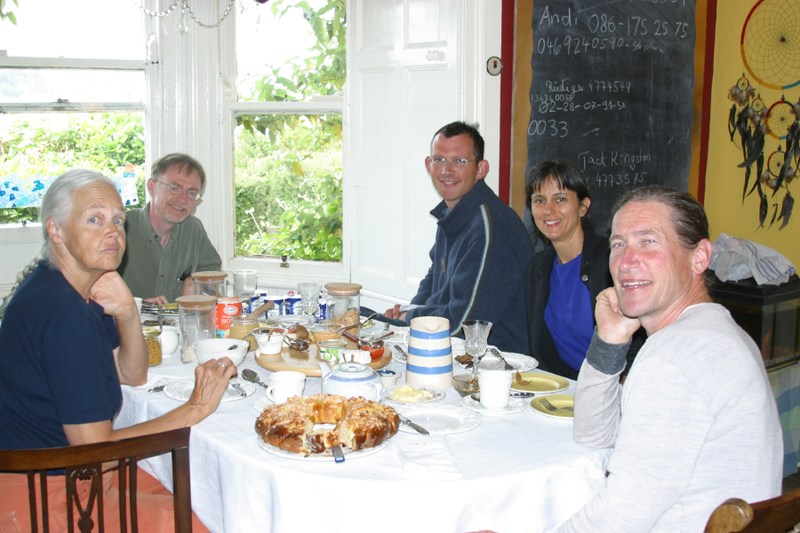 One to Japan, Europe and North America in 2005 that, amongst other results, contributed to the beginnings of the Transition movement in Kinsale Ireland with Rob Hopkins, and one in 2007 to NZ, Brasil, Venezuela, Cuba, Mexico, Argentina and Chile, which helped consolidate and deepen the diverse networks of permaculture activism in Latin America. Along with several trips to NZ and Japan of a few weeks these 6 month trips are the total of my overseas experience. For someone of my modest but global influence this is a very limited amount of overseas travel, but being by air means the total impact on the climate takes our household greenhouse gas emission from less than 10% of the Australian average to a much less impressive 30% of the Australian average. If I had flown as much as many colleagues, then our household greenhouse gas emissions would have been well beyond the Australian average into to that of the global elite. Beyond GGEs I see the depletion of precious high quality transport fuel as a additional debt that needs to be justified by the value of what is achieved by the travel. I remember a discussion with a fellow passenger on a packed business flight from Sydney to Melbourne in 1990 that illustrates this well. I was musing on the balance of values in my air travel from Victoria to Orange NSW, for a two-day workshop of writers of the first Australian postgraduate course in sustainable agriculture. The woman next to me was returning from a day trip to Sydney selling desktop computers to small businesses. Her candid admission that the equipment she was selling was little different from competing brands made from the same components underlined her perception of the trip as pointless (beyond earning her daily bread). Her master’s degree in mathematics only emphasised the waste of human as well as natural resources. The comparison with her trip diverted my attention from my own ethical questions to wondering about the possible value from a whole planeload of Melbourne–Sydney business day-trippers. The principle of Small and Slow Solutions suggests that when we do go far and/or fast we should get and contribute maximum value. The principles of diversity and integration suggest we should be focused on multiple values and functions in everything we do but especially in high powered, high impact activity. So why not continue to fly overseas using this model? After all isn’t my work around the world the most important contribution I can make to a better world? While I can see the beneficial outcomes of my overseas travel, I also believe that much of the power of my presentations, teaching and influence comes from the modest home based self reliant way of living that informs my work. There is little doubt I could have more influence over more people by travelling more but I believe the less I travel the greater the integrity and quality of my influence when I do. David and Su with Roberto Perez at the Casemeara farm Cuba, with his certifcate from the 2007 Advance Principle course. 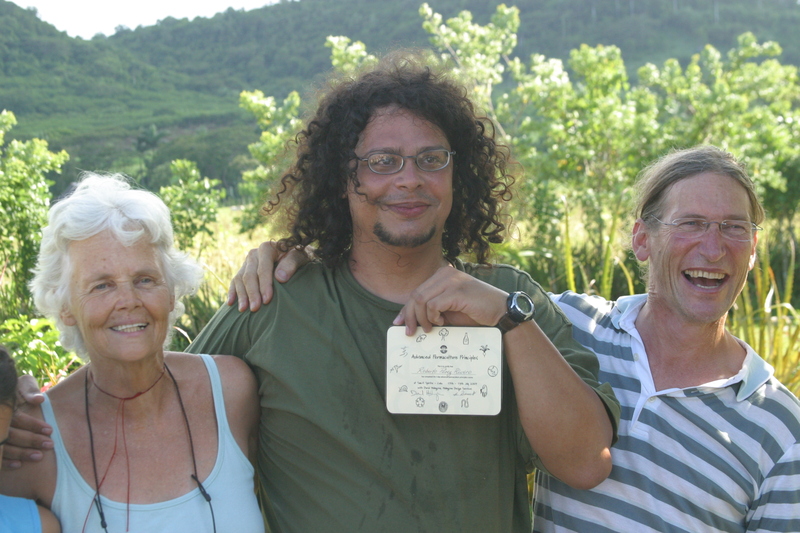 Roberto is the permaculture activist who featured in the film The Power of Community. There are many additional reasons that suggest abandoning our previous model. Firstly such long trips away from home are very demanding, as might be expected. I am not adverse to hard work , but full time reading landscape, combined with all the stresses of relating to so many people as well as the issues of language interpreting over several months are exhausting. To compensate we limit the number of presentations to make sure we can engage with colleagues and places. By this engagement we contribute and learn things that aren’t achieved with a high pressure itinerary that is focused on quantity of people influenced rather than quality of engagement and exchange. But even with our slow, local and rural approach to itinerary organisation, the amount of time spent in big cities, freeways and airport hubs exposed to all the stupidities and disempowerment of airport security, crap air, light, water and food along with other realities of the modern world. For many environmentalist colleagues, all that stuff is tolerable as a means to an end. I find it an assault on my senses and values that undermines my the environmental sensitivity that is the basis of my ability to read landscape. I experience the immense embodied energies of the technosphere viscerally, not necessarity as something bad but just overwhelming. 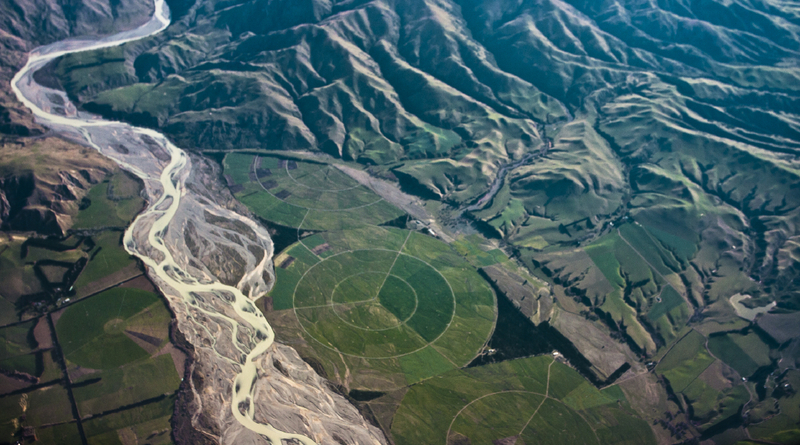 The more time spent in the high energy technosphere the more we are desensitised to nature’s patterns. Admitting such a reaction may suggest weakness, self indulgent neo-primativism, and delusion about reality. I see it differently. One essential pre condition for a benign energy descent future for humanity is the process by which those of us with privilege and endless opportunities choose not to swill at the pig trough, that corporate capitalism is making of the world. But this restraint from endless indulgence will not spread if it is driven only by puritanical atonement. It must also be because we find the experience degrading or even disgusting. I see it as little different to the way I have (since a young adolescent) felt an aesthetic disgust for mixed household rubbish, or the extremely rare experience of needing to visit a supermarket or shopping mall. The extremity of distaste and alienation comes from airports; everything from the shopping mall temples to consumption, to the ridiculous airport security, I experience as an assault to my values and my person. Whether by conspiracy or perverse accident I view the ritual of airport security as a process by which the travelling (middle) class get a regular dose of propaganda about the so called “war on terror”. And of course if you respond to this earnest process with the ridicule it deserves you are likely to be detained if not tortured, that still being reserved for demonised groups and nationalities. To get anywhere else in the world by air one has to pass through this conduit of Kafkaesque absurdity before we can arrive at any real place where people have some autonomy and connection to nature. I had a sense of how different it could be getting on the Shinkansen (bullet trains) in Japan in a station not unlike an airport except without all the absurd security apparatus. Stories of friends travelling by merchant ship ending with a shared cup of tea with the customs officer before disembarking, gives a taste of long distance travel in an energy descent future. Such a story might become a rare once in a lifetime experience to be savioured and reflected upon. The second reason for not travelling overseas is that Su and I have decided we wanted to return our focus to the local. It’s never as exciting dealing with the realities of nature and community where we live, compared with tasting the fruits of novel ones in other places (outside the homogenize technosphere). Ultimately the future will be local, so while the networked world of like minded souls is enormously attractive, the really hard work for any of us who have been fated as a visiting guest from overseas and who have tasted the power of influence that comes from such relationships, the experience of just being another member of the local community can be humbling if not degrading. This is especially so in Australia where the “tall poppy syndrome” applies for better and for worse. Nevertheless I feel that modelling the process of becoming a respected and effective member of a local community rather than an idiosyncratic individual at odds with the world is arguably the most important work that we can project globally. The third reason not to travel is the extraordinary opportunities provided by the internet to continue to present one’s latest work, sell digital products, participate in local and network conversations across the globe and keep in touch with family. I see the internet as providing an easy transition for the flying addicted elite and middle class but one that is not taken seriously. We have always worked from a home base in a small rural town ignoring the so called advantages of the city. Over the last decade, the expanding capacities of the internet have massively increased our power to be effective in the world, without travel. Of course this is a paradox because the information technology industry may collectively have as much adverse impact on the planet as the aviation industry even if the direct use of energy in information transactions is a small fraction of that involved in personal travel and goods transport. Systems theory also suggests that the most recently evolved aspects of complex systems are generally the first to fail when system go into overshoot. Consequently we don’t expect the internet to be anything more than a transition technology to the energy descent future. We take advantage of it while it lasts but try to resist deep systemic dependence on computers and the internet. More challenges and issues ahead but for the time being the existing internet capacity over the aging Australian copper wire network, reduces our need to send books and fly to present my work. I am currently uncertain whether I believe the new Australian NBN network is a great piece of infrastructure for the energy descent future or simply another version of bigger freeways that generate more traffic with all its downsides. On semi regular annual visits to teach and speak to Adelaide and Sydney I take the slow train (literally) and enjoy reading the landscape and stretching my legs. The day long or overnight trip also gives me time to ponder how Australia as one of the richest countries in the world put all its eggs in the basket of cheap road and air transport, following the American model. It really was the trains in Europe and Japan that, for the first time gave me something of the feeling of being from the “poor global south”. 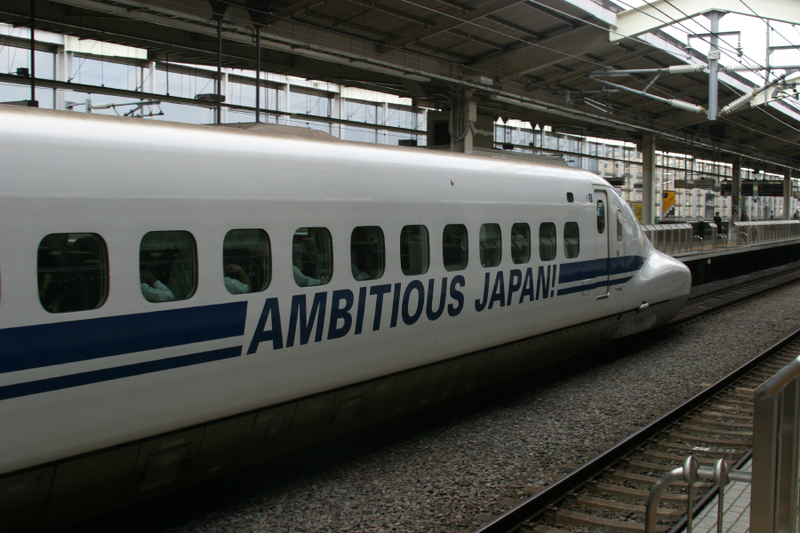 Ironically trains as fast as the Japanese Shinkansen (300kph) maybe faster than is sensible to expect to travel in the future and at the worst give the privileged a way to continue long distance commuting. We are in the early stages of planning a ’round Australia speaking tour with Nicole Foss for next year, so it might be challenging to avoid travelling by air. Whatever the outcome, the reasons why we have consistently minimised our use of high speed transport for short stays over more than 30 years have been validated by an expanding body of evidence that widespread and frequent flying is a late 20th century behaviour that has no future. Avoid the crowds and get used to it by being an early adopter of slow and small (local) solutions. Thanks David, lots to think about there. I’m interested that exposure to superstimuli exhausts your sensitivity to natural world observations later, but I guess that makes sense. My personal experience (and observation of others) suggests that we respond to strong stimuli (visual and otherwise) by turning down the “volume”. It takes time, hours, days even weeks to gradually turn the volume back up. I remember when living the bush in Jackys Marsh without electricity (in my 20’s) that my eyes could continue to adjust to darkness for many hours after leaving my dimly lit hut, to the point that it was possible to see or sense objects on a moonless overcast night in the bush with zero light pollution. Age means my eyes don’t perform so well now but I think this phenomenon applies generally. Beyond lag time I think habitual desensitisation becomes permanent especially over the years. Its like lots of bad habits, we can manage without too many adverse consequence when young but those consequences accumulate over the years. Maybe we need an eMergy dosimeter when venturing into the technosphere. Re the stimulation and over-stimulation of airports and other travel contexts – there is much research on effects of “over-stimulation” on human development, especially in recent decades as entire generations of industrial culture children are exposed to ever increasing levels and intensities. We are definitely creating environments that are guaranteed sensory overwhelm for humans. In fact this is done intentionally in retail shopping environments, to produce unease and disorientation, with “shopping” as the “cure” – that is, people adapted to a consumer culture experience shopping and buying stuff as “relief” or “therapeutic” when triggered by these intentionally overstimulating environments. Casinos BTW use this same method, generally at even higher levels of stimulation. Most all commercial visual media does likewise, advertising especially, whether intentionally or simply by doing what all the competition is doing. 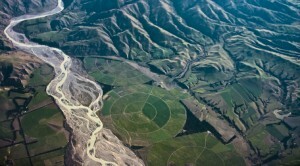 Beyond that, and more valuable to permaculture’s foundations in observation, observation, observation: about 15-20% of the population of most life forms with nervous systems, including humans, are sensory-processing sensitive” (the scientific term), or simply “highly sensitive persons” – our brains and nervous systems have non-trivial differences in how we process sensory information. …indicates that air travel is about even with commuter rail in per passenger mile energy usage, and is grouped closely with all forms of rail transit, which are significantly more efficient than personal cars and trucks. Note also that transit buses are less efficient than personal vehicles. Taxis are abysmally inefficient on this overall scale. So it’s really not fair to demonize air travel alone, when it’s almost as efficient as passenger rail per passenger mile, significantly better than private vehicles as well as transit buses. In the USA there is a habit among the politically correct to demonize SUVs (“Sport Utility Vehicles,” the largest and least fuel-efficient of personal vehicles in our domestic market) and praise high-MPG (l/Km) rated vehicles (hybrids and sub-compacts and so on). I have wondered but have not yet found any studies on the reality of this. 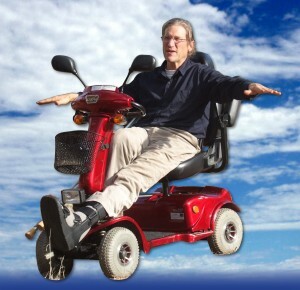 I am wishing someone would do the numbers on “true cost” (energy-wise) of personal vehicles, and what portion of that is the actual fuel used to move the vehicle from A to B. All cars at whatever MPG (or l/Km) require the same energy-intensive infrastructure to be any use at all. Roads and car parks, and all that goes into making them, both materials and machinery and the production and maintenance of that machinery; and, the entire infrastructure pyramid of production, parts and repair for the vehicles themselves. I would wager that the MPG (l/KM) portion of a vehicle’s total energy use is less than 10% of that total. So a 20% or even 50% difference in MPG is trivial in the overall effect of a vehicle. And, that comparison and curiosity aside – I agree that re-localization is core to re-integration of our species with larger ecosystems, and also about the massive annoyances surrounding air travel since the WTC buildings were demolished. I agree that the differences in fuel consumption of motor vehicles may be a minor component in the overall environmental cost of personalised transport. Also larger vehicles are not so inefficient if carrying their full complement of passengers and luggage relative to smaller vehicles that lose efficiency as they are loaded more fully. On the efficiencies of air travel, I understand the figures in terms of per passenger mile but the primary problem with air travel is the high speed (still at relatively low cost) that encourages much more travel that would never have been considered by lower speed surface transport. The capacity to travel great distances in a day leads the rapid escalation in total travel (as we have seen). Most of this travel would not have happened without planes but in a few decades, business, professional and personal lives of the billion or so middle class people have been transformed with massive increases in energy consumption, greenhouse emissions and environmental impact. This is classic Jevons paradox where an increase in the (time) efficiency of travel leads to greater consumption, not less.